I saw a good photograph last week. It showed Irish sprinter Sam Bennett, together with his friends from several other professional teams, out for a winter ride together. A few days later, I got a further update from Monaco. “Guess what pace they were doing?”, my friend asked. I wanted to get the answer right, so I took a while to reply, and was generally vague. “I suppose somewhere between 35 and 40?”, I replied, but it was more of a question than an answer. “They averaged 25”, he said, and we quickly agreed that was a sensible winter training pace, even for professionals. Kilometres per hour, by the way, not miles. Also, by the way (once again), that’s our Group 4 target pace. These professional boys are in good company. Last week there was mention of Christmas lists, and now that it’s approaching the official start of the season, Group 4 cycled several hills just to meet the man of the moment. The woman of the moment was by his side, keeping him on task, and by the looks of things, well fed too. It has been a full month since the newest Dungarvan Cycling Club group was kickstarted. Mind you, things are happening thick and fast in this club, and now the group is no longer the newest group, as there has been a further addition. I’ll be on to this like a fly on butter as soon as there is news to report, but in the meantime will concentrate on the stylish Group 4 once again. A large Group of 15 riders assembled for their first monthly hill spin on an overcast and windy morning. You could sense the excitement from the group as they chatted about tactics for the upcoming ascents which would culminate with a meet and greet with Santa and Mrs. Claus and maybe a pic of two. The group headed towards their first climb of the day up to Ring. Even the strong cross winds couldn’t deter the good steady pace that was set from the start. With the group nice and warm and the fist climb over, the group headed through Old Parish into Ardmore and onto Piltown. With the coffee stop in sight at the Blackwater Garden Centre the steep 1 km climb was attacked at various speeds with Tony at the front with thoughts of being the first to meet Santa. Unfortunately, Tony was eclipsed once again by Rose and Karen who got to sit on Satan’s knee… ( while Tony looked on thinking that’s not fair I got here first). 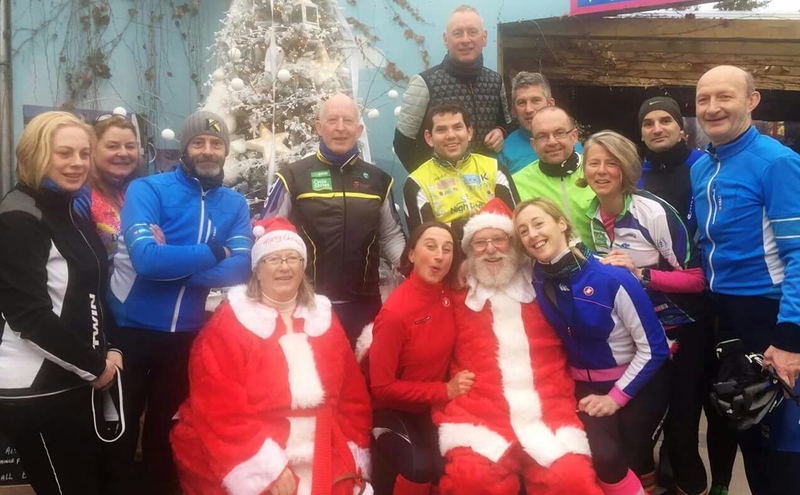 The group refuelled with coffee and mince pies and Paraig had a quiet word with Santa regarding a new bike for Christmas, and we headed for Piltown. A good controlled pace was set into Clashmore where the group took the high road into Aglish then onto Ballinameela and back to Dungarvan. A total spin of 67 km with an Avg of 23 km. 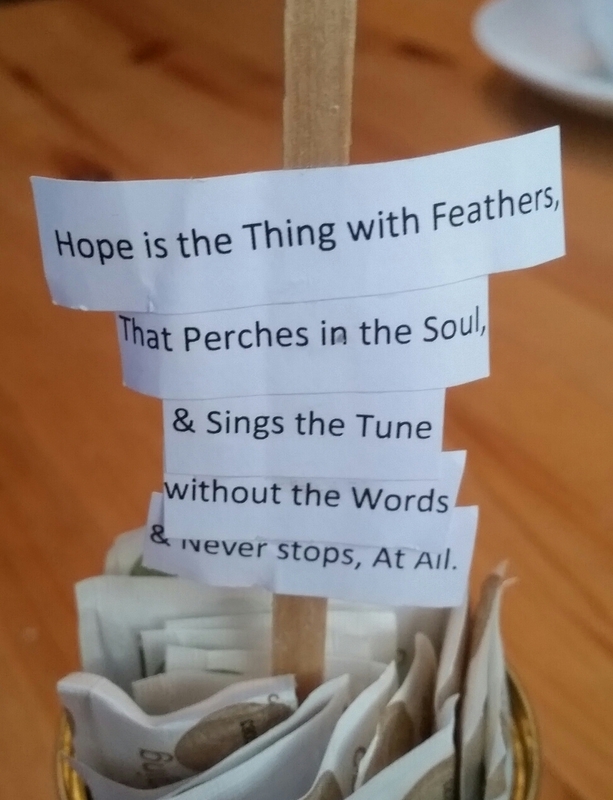 While I was having a coffee and mince-pie at Blackwater Garden Centre, I saw this on the table, among the sugar sachets. Emily Dickinson’s advice: Don’t quit. Keep going. You can do it. Persevere. There was mention of hills last week, and this week there will be no such mention of them (hills), save to congratulate everyone who passed the test with flying colours. My ears picked up some Gaeilge behind me just as the group approached high ground between Clashmore and Aglish. Ba álainn liom an ghaeilge a chloisteáil. I am aware that there are four within the group who can converse and curse in Irish (mostly approaching top of a hill), so perhaps we will build on this! The bike tip this week has nothing to do with hills or Irish, or indeed cursing. Try to stay cycling using your SMALL front ring for most of the spin. This will become more important from March onwards or whenever the spins exceed 100k. We see cyclists who ARE able to use the big ring. However, sometimes they “cycle with their shoulders”. Cycling like that uses up valuable energy, and it would be better to save that wasted energy until the last 20-30k of a LONG spin. From about March onwards, select a small short hill (for example Ballyvoile if you are in the Dungarvan area)*, and practice using the big ring just to develop leg strength. Maybe start for the first few weeks with just the second half of the hill in the big ring, if you prefer. This might be best done during the week or on your own, once a week. Pick any hill you like that’s not too hard or too long (about 5 – 10 minutes). You do NOT need to do a hill in the big ring more than once a week. Others may offer you conflicting advice. For what it’s worth, this is my take on it. If others suggest otherwise, see what works best for you. While enjoying the upcoming Christmas party night, please remember that several will want to cycle the following morning. So, just ask politely before buying someone a drink, as it is not a good idea to lead serious winter athletes astray. I was led astray once, so I know how to react when someone tells me they intend cycling next Saturday. Be cyclist aware. Anyway, back to Barry and The Cycling Blog. Barry has written a very motivational piece about improving your cycling, whether you be a newcomer or indeed another Sam Bennett. It’s called Rockys Rules for Cycling. If you only read one more blog today, read this. * if you live near Sligo or even Cork, there’s a hill very similar; in fact, no matter where you live, there is likely to be something similar. This article is dedicated to the families of those who died and were injured near Dungarvan last Sunday, 4th December, 2016. I just had the remnants of my last training ride in the rain come poring out of the frame during a tune-up at the shop. Sigh… Maybe I’ll be faster now without that extra water weight. There’s a lovely Irish phrase: Go n-eirí an bóthar leat. Literally, may the road rise with you. Perhaps not the most appropriate for a nomadic biker, but along the lines of “May the wind be always at your back.”. Ride on, Eileen On, and I’ll be following your journey! Thanks! I do feel like the road rises with me and the wind is always at my back.